The Baltimore-based Ru-Jac label, a long-time favorite of in-the-know collectors, is finally getting its historical due. Omnivore began digging the Ru-Jac vault with 2016 titles on Winfield Parker and Gene & Eddie, and now traces the length of the label’s entire story with four expertly curated, smartly illustrated and knowledgeably notated volumes [1 2 3 4]. Ru-Jac was born from the unlikely confluence of a numbers-running real estate investor and a dry cleaner with a sideline as a promoter. 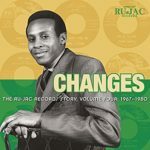 The latter, Rufus Mitchell, gained a spot managing the operations of the summer resort Carr’s Beach, and developed a nexus of musical acts, managers and disc jockeys that provided a foundation for a booking agency, a song publishing concern, and finally, the Ru-Jac record label. 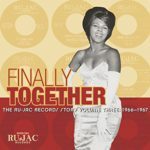 Volumes 1 and 2 highlighted the beginnings of Ru-Jac, chronicling singles from 1963 to 1966. Volume 3 picks up in that latter year with a pair of singles by Rita Doryse. As Kevin Coombe’s liner notes explain, Rufus Mitchell’s busy schedule managing Carr’s and the flourishing of his dry cleaning business drew him away from his record label, and Doryse’s singles, alongside the Mask Man & The Cap-Tans’ “Love Can Do Wonders” (included on Volume 2), were Ru-Jac slate for 1966. The first of Doryse’s singles, recorded with backing by the Shyndells, is top-notch soul, with moody horns and emotional vocals of loneliness and longing. The B-side, “When I’m Alone,” previously recorded by Winfield Parker (and included on Volume 1), trades the original’s gospel style for a terrific Stax style. Doryse’s second single, backed by the organ-based Bob Craig Combo, is more supper club than urban soul, with a B-side cover of “Goodie Goodie,” a Johnny Mercer song that was a hit for Benny Goodman in 1936 and Frankie Lyman in 1957. Neither the top side’s torch singing nor the flip’s bouncy pop played to Doryse’s strengths; more fetching is the Brill Building pop of the previously unreleased “Born to Be Loved.” 1967 kicked off memorably with Kitty Lane’s funky “It’s Love I Need” and it’s mid-tempo B-side “Sweetheart.” Lane was a fiery vocalist who briefly backed Otis Redding; here she’s backed by a hot horn section, and on the A-side, a terrific organ player. 1967 also saw the reappearance of label stalwart Winfield Parker, featured here on an alternate take of the Arthur Conley-written “Go Away Playgirl” (for the master take, see Mr. Clean: Winfield Parker At Ru-Jac), as well as the single “Sweet Little Girl” and a pair of demos. 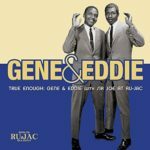 The year also welcomed the first Ru-Jac release by Gene & Eddie, whose early sides suggest both the mournfulness of Otis Redding and the bouncy duets of Sam & Dave. The duo’s songwriter and producer, Joe Quarterman, performing as Sir Joe, is also heard here on the effervescent “Nobody Beats My Love.” Fans can find their extensive singles catalog anthologized separately on True Enough: Gene & Eddie With Sir Joe At Ru-Jac. Volume 3 is filled out with a pair of previously unissued instrumentals from the house band, the Shyndells, Leon Gibson’s invitation to dance, “Do the Roller,” it’s Bo Diddley inspired B-side “Working Hard,” and four previously unissued sides by unknown artists. Among the latter are a demo of Arthur Conley’s “Sweet Little Girl” (which plays back-to-back here with Winfield Parker’s finished single), the gospel soul “Finally Together,” the stage-ready showpiece “Searching” and the ballad “Never Never Leave Me.” After the low output of 1966, 1967 was a strong year artistically, if not commercially. Mitchell’s ear for talent continued to shine, and the continuing presence of Winfield Parker and arrival of Gene & Joe gave the Ru-Jac stable a strong lineup. Mitchell drew his acts primarily from Baltimore and D.C., releasing a string of excellent singles that began with Jesse Crawford’s dramatic plea “Please Don’t Go” and it’s sorrowful B-side “I Love You So.” A distribution deal with a larger label wasn’t enough to garner any commercial action, but Mitchell was undeterred, and doubled-down with a second pair of soul laments by Sonny Daye. The A-side, “A Woman Just Like You,” is a deeply wounded mid-tempo number with a fetching sax hook and a Latin undercurrent; the flipside pairs a raw blues guitar with a soul croon. As with the initial release, the single’s lack of commercial success barely slowed Mitchell down, as he continued to capture magic on tape, whether or not the stars aligned to lift his singles onto the charts. The first two years of Ru-Jac were filled with terrific records, and even more impressively, a few A-side-worthy tracks that never made it out of the vault. The set opens with the wicked soul jam “Fatback,” a tune that should be the fondly remembered closing theme of an early-60s Baltimore TV dance show; something John Waters could have reintroduced to the world in Hairspray. In that same fictional history, the slower “Cross Track” would have replaced “Fatback” mid-way through the second season (after a single episode in which “Trash Can” was used) when the show’s producer and the record label had a falling out, and fans would argue to this day which was the better show closer. Those same kids likely would have spent their summer time at Carr’s Beach, making the resignation and renewal of Brenda Jones’ “Let’s Go Back to School” someone’s very fond memory. Baltimore native (and former carnival pitchman) Winfield Parker first appeared on Ru-Jac with the moody, Stax-influenced 1964 ballad “When I’m Alone,” backed with the mid-tempo “One of These Mornings.” The latter is presented here in a previously unissued horn-lined alternate that some will find bests the master found on Omvnivore’s Mr. Clean: Winfield Parker At Ru-Jac. Winfield would turn out to be one of the label’s most prolific artists, and perhaps even more importantly, the caretaker of the label’s legacy. With Mitchell’s passing in 2003, the label’s riches – which included tapes, promotional material and business records – passed to Parker, who has now passed that archive on to Omnivore, while serving as the executive producer for these releases. 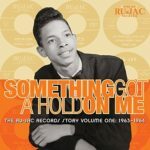 Volume Two picks up the story in 1964 with Brenda Jones’ second Ru-Jac release “It Must Be Love,” its flipside, and the previously unreleased 50s-styled ballad “So Alone.” The year finished out with singles by D.C. native Shirley Grant and Harrisburg organist Butch Cornell. The latter pair of sides are particularly fine, as Cornell offers up Hammond B-3 licks in a trio setting with a jazz-chording rhythm guitarist and a hard-swinging drummer. A previously unreleased alternate take of Cornell’s “Goose Pimples” gives the song an entirely different feel from the single, with a full horn section and dance-friendly go-go beat. 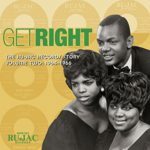 1965 brought the legendary Arthur Conley to Ru-Jac as the songwriter and vocalist on Harold Holt’s “Where You Lead Me” and its flipside “I’m a Stranger.” Conley’s songs graced other Ru-Jac artists records, and Conley self-recorded several piano-and-voice demos, two of which are included here. 1965 also brought a sharper focus on DC acts, including The Neltones and Bobby Sax, and in 1966, The Mask Man & The Cap-Tans with The Paul Earle Orchestra. Like many of Mitchell’s signings, all three were one-off Ru-Jac artists, and though there was some regional action, like the rest of the Ru-Jac roster, there was no national breakthrough. 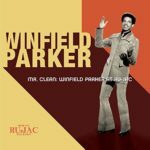 The durable Winfield Parker is represented here by two previously unreleased recordings of “I Love You Just the Same,” one a demo with Parker singing slightly off mic, the other a finished studio alternate of the original single. Two garage rock bands borrowed talent agent Lillian Claiborne, The Reekers and The Henchmen, are omitted here, leaving the door open for Bear Family to render the Complete Ru-Jac box set. Omnivore’s second volume of material from Baltimore’s Ru-Jac label focuses on the singles of Washington, D.C. soul duo Gene Dorsett & Eddie Best, and fills out the disc with a trio of tracks from their producer Sir Joe Quarterman and a pair from Gene & Eddie’s time with the Nightcaps. Ru-Jac was founded as one of the first African-American owned labels by Rufus Mitchell, and grew out of his work managing and booking musical acts for the Carr’s Beach summer resort in Annapolis. The label’s catalog began in 1963 (with Jessie Crawford’s “Please Don’t Go”) and stretched into the early 1970s, featuring mostly soul, but also some jazz and even garage rock. Gene & Eddie opened for and toured in support of major R&B acts, but never broke nationally. They had a regional hit with the doo-wop influenced “It’s So Hard,” and plenty of other hit-worthy original material, but a small, independent label from Baltimore apparently didn’t have the muscle (or the funds) to break the act nationally. Their early singles show the influences of Sam & Dave’s effervescence, Otis Redding’s mournfulness and Wilson Pickett’s funky bounce. Quarterman’s mono productions are full-bodied and nicely balanced, backing Gene & Eddie with horn-rimmed arrangements and solid female backing vocalists. By the early 1970s, “It’s No Sin,” “Darling I Love You” and their B-sides turned from Stax to Philly and Motown for sound inspiration.